One of the things I've been working on in my personal Restorative Exercise practice is upper body strength. I bought one of these and my kiddo and I have lots of fun hanging from it, however I'm a long, long ways away from being able to move from hanging to hoisting my body weight up. A few months ago we were visiting my brother and his family. They have a fantastic neighborhood playground complete with a nice tall set of monkey bars. I'll be perfectly frank, I am the antithesis of a physical risk taker. While I did earn the honor of climbing the highest in the favorite neighborhood tree as a kid, I'm also the kid who, after waiting in the long line to jump off the high dive at the pool, walked out to the end of the diving board, looked down, turned around and made everyone who was lined up behind me move down the ladder so I could escape. Now monkey bars may not seem like any big physical risk but as I stood before them, I sized them up. I assessed how much space was between my feet and the ground and whether or not a hard landing would jar my ankles. I wondered if my hands were strong enough to hold on or if I'd lose my grip and fall. I could feel my adrenaline surging. At the same time, I wanted to see if I had enough upper body strength to cross the damn monkey bars. They're just monkey bars, and it's mulch beneath them for crying out loud. I did my best to psych myself up. I climbed the rungs and took the plunge - just hanging. I let go and landed on the ground. That was entirely doable. Then it was time to start traveling. I hung from the bar and started swinging my legs from side to side to generate enough momentum to carry me to the next bar. I made it across reaching forward with one hand and bringing the next one to meet it. Baby steps. My heart was pounding. Then for my grand finale I decided to attempt the Real Thing - each hand on it's own bar as I swung across. I did it!!! I was officially a monkey bar badass. If you'd like to join me in the Monkey Bar Badass Club and it's been decades since your last monkey bar crossing, for the sake of your ligaments and joints, start slowly. 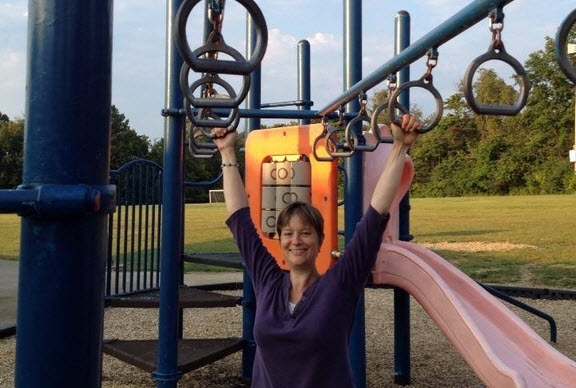 This post will give you some ideas for for gradually building your monkey bar strength. Learn from my mistakes and give your body plenty of time to gradually transition before giving the monkey bars a whirl.